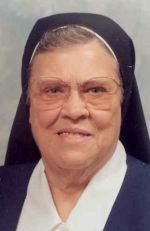 Sister Mary M. Bentz, I.H.M. Sister Mary M. Bentz, I.H.M., formerly Sister Nicolas Mary, died April 28 in Camilla Hall, Immaculata, in the 58th year of her religious life. She was 85 years old. Born in Lancaster, Pa., Sister Mary entered the Congregation of the Sisters, Servants of the Immaculate Heart of Mary in 1956 from Sacred Heart Parish in West Reading, Pa., and professed her vows in 1958. She taught for over 40 years in the Archdiocese of Philadelphia and Diocese of Allentown. She then worked as a school assistant before retiring to Camilla Hall in 2010. The funeral Mass was celebrated May 2 at Camilla Hall. The celebrant and homilist was Father William E. Dean. The concelebrant was Father Joseph N. Accardi. Sister Mary is survived by members of her religious community, her brothers, William, Nicholas, Richard and Thomas, and a sister, Theresa Caton, sisters-in-law, nieces, nephews, grandnieces and grandnephews. She was predeceased by her parents, Nicholas and Mary E. Schlegel Bentz and four brothers, Robert, James, John and Joseph Bentz.